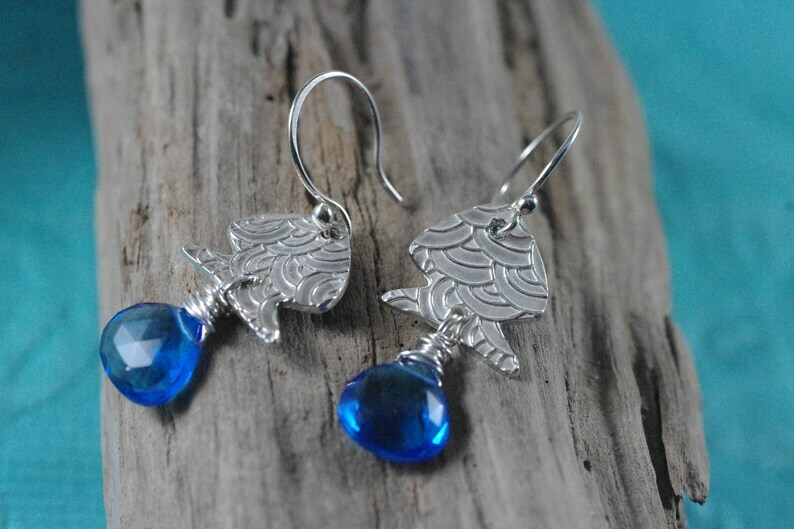 These beautiful earrings are fine silver scale textured fish and they make the perfect earrings for anyone who loves the coast. The briolettes are 10mm Swiss Blue Quartz Faceted Heart Shape Briolettes. I created the fish by hand with metal clay. I shape and texture the clay to form the fish, fire them in my kiln, and polish. I have also created the earwires from sterling silver wire by forming, hammering and polishing them to a soft shiny finish. So much nicer than bought pre-made earwires. ♥ hang to a total length of 1 3/4"